These comments suggest that NATO troops could be called upon to assist Afghanistan in protecting the pipeline. Since pipelines last 50 years or more, this could auger a very long commitment in Afghanistan. On November 14, Pakistan and Turkmenistan signed an agreement to build the $7.6 billion Turkmenistan-Afghanistan-Pakistan-India (TAPI) gas pipeline project under which Pakistan will get 1.3 billion cubic feet per day of gas. The agreement was signed during a visit by President Gurbanguly Berdimuhamedov of Turkmenistan to Islamabad. 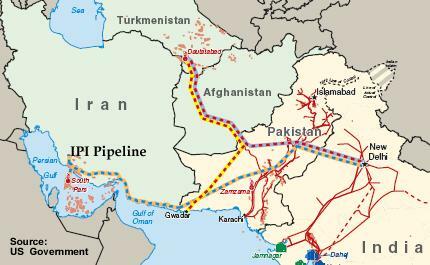 The trans-Afghanistan pipeline, first proposed in early 1990s, will transport Caspian Sea natural gas from Turkmenistan through Afghanistan into Pakistan and then to India…. The original project started on 15 March 1995 when an inaugural memorandum of understanding between the governments of Turkmenistan and Pakistan for a pipeline project was signed. This project was promoted by Argentinian company, Bridas Corporation. The U.S. company Unocal, in conjunction with the Saudi oil company Delta, promoted alternative project without Bridas’ involvement. In 1995, Unocal signed an $8 billion deal with Turkmenistan to construct two pipelines (one for oil, one for gas), as part of a larger plan for two pipelines intended to transport oil and gas from Turkmenistan through Afghanistan and into Pakistan. In August 1996, the Central Asia Gas Pipeline, Ltd. (CentGas) consortium for construction of a pipeline, led by Unocal, was formed. Since the pipeline was to pass through Afghanistan, it was necessary to work with the Taliban. In January 1998, the Taliban regime, selected CentGas over Argentinian competitor Bridas Corporation, and signed an agreement that allowed the proposed project to proceed. In 1997, representatives of the Taliban are invited to the Texas headquarters of Unocal to negotiate their support for the pipeline. Future President George W. Bush is Governor of Texas at the time. The Taliban appear to agree to a $2 billion pipeline deal, but will do the deal only if the US officially recognizes the Taliban regime. The Taliban meet with US officials. It was reported that the Taliban met with Enron officials while in Texas. Enron, headquartered in Texas, had a large financial interest in the pipeline at the time. On December 5, 1998, Unocal announces it is withdrawing from the CentGas pipeline consortium, and closing three of its four offices in Central Asia. President Clinton refuses to extend diplomatic recognition to the Taliban, making business there legally problematic. On May 30, 2002, Afghanistan’s interim leader, Hamid Karzai (who formerly worked for Unocal), Turkmenistan’s President Niyazov, and Pakistani President General Musharraf meet in Islamabad to sign a memorandum of understanding on the trans-Afghanistan gas pipeline project. TAP is consistent with the US declared policy of linking Central and South Asia and diversifying export routes for Turkmen gas. The proposed 1,680 kilometres pipeline could carry one trillion cubic metres of Turkmen gas over a 30-year period, according to Turkmen Oil and Gas Minister Bayramgeldy Nedirov. But the route, particularly the 735 kilometres Afghan leg, presents significant security challenges. The trans-Afghanistan pipeline (TAPI) agreement has been signed at a time when Washington is pressing Islamabad to abandon the pipeline project to supply Iranian gas to Pakistan. Washington has never tried to hide its opposition to Pakistan`s plans for importing gas from Iran and has always pressured it to seek alternate options. The purpose has been to isolate Tehran in the region over its nuclear program. Apparently, it was under US pressure that India decided to opt out of the project in 2009. In return, New Delhi successfully secured US cooperation for its civil nuclear power projects in 2008. On April 12, 2010, Iran announced that it has completed construction of 1,000 kilometers of the pipeline out of the 1,100 kilometers portion on Iranian soil. On this Iranian ambassador to Pakistan said that “Iran has done her job and it now depends on Pakistan”. The construction of the pipeline on Iranian side is on pace to be completed by 2011. According to newspaper reports on 17 June 2011, Iran has given up talks with India on the pipeline and is pursuing the pipeline bilaterally with Pakistan. In July 2011, Pakistani minister for petroleum and natural resources announced that Iran has finished its work on laying the pipeline and Pakistan would start the work for building the pipeline within the next six months. The 2,775-kilometre (1,724 mi) pipeline will be supplied from the South Pars field. It will start from Asalouyeh and stretch over 1,100 kilometres (680 mi) through Iran. In Pakistan, it will pass through Balochistan and Sindh. In Khuzdar, a branch would spur-off to Karachi, while the main pipeline will continue towards Multan. From Multan, the pipeline may be expanded to India. The paper said, apart from the relative merits of the projects, one of the biggest services the present government can perform for the USA is to give the impression that the Turkmenistan-Afghanistan-Pakistan-India (TAPI) gas pipeline is in any way a substitute for the Iran-Pakistan-India (IPI) gas pipeline. The Nation emphasized that Pakistan needs both the projects if it is to meet the gas shortages that have already hit the country in the past, and which will further worsen, reaching new heights this winter.